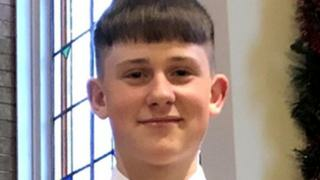 Image caption Louis White's "zest for life... could light up a room"
A boy who died on his 15th birthday after a cycle crash was an "amazing young man", his family have said. Louis White, from Rochdale, suffered serious head injuries when his bicycle crashed with a black Volkswagen Golf on Monday evening. He died the following day in hospital, Greater Manchester Police said. His family agreed to donate his organs in the hope of saving the lives of others. A fundraising appeal has been set up by a friend to help pay for his funeral. Summer Dolan's campaign has so far raised nearly £600 towards its £1,700 target. Paying tribute to Louis, his family said: "Louis had a zest for life and his smile could light up a room. "He loved to play football and had big dreams of turning professional. "We have lost an amazing young man, tragically on his 15th birthday. We will love you forever and miss you for longer." The collision occurred on Milnrow Road, close to the junction with Kathan Close, at about 21:00 GMT. The driver stopped at the scene, police said. No arrests have been made.